On March 28th, 2019, The Leap hosted this public webinar with The Leap’s Senior Manager of Programs and Development Maya Menezes, in conversation with leading migrant justice activists and organizers. The conversation explored what migrant justice is, and how policies and worker programs in Canada are built to exploit people and make migrants precarious. We know that more people than ever before will be on the move because of climate related impacts- with the poorest communities impacted first and hardest. The rise of rampant xenophobia, racism, white supremacy and Islamophobia are not separate from the climate crisis. In fact, they are symptoms of climate impacts hitting. Join us as we unpack the ways in which the criminalization of migrants and refugees, the closing and ratification of borders across the world and the rise of right wing extremism are one in the same. 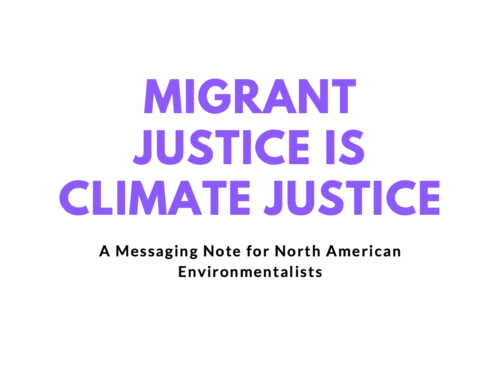 Climate justice is migrant justice. Macdonald Scott is an immigration consultant, a longtime activist with the Ontario Coalition Against Poverty and organizer with No One Is Illegal-Toronto. Karen Cocq is an organizer with the Workers’ Action Centre and the Fight for $15 & Fairness campaign, based in Ottawa. She is active in local efforts to build a broad-based fight back against the Ford government, and has been active in migrant justice, anti-poverty, and labour struggles for almost two decades.